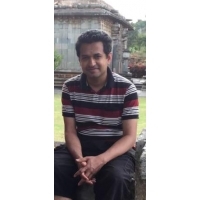 Shrikaanth Krishnamurthy is a psychiatrist from Bengaluru (Bangalore) India, living in England for over a decade. A trained vocalist and a composer in Indian Classical Music, he writes poetry in several languages including Kannada, Sankethi, Tamil and English. He is particularly interested in haiku, tanka and other allied genres. Many of his writings have won prizes and been published in various reputed journals. He is also the proofreader for the journals Cattails and Skylark. For him, writing is not only a means of expression, but also a form of therapy to overcome day to day stress. Awards and Other Honors: Some of Shrikaanth's prizes include: the An (Cottage) prize in the Genjuan International Haibun Contest (2015); a runner-up in the Snapshot Haiku Calendar Contest (2015). Credits: "the roughness" - Cattails (January 2015); "soft drizzle" - Mainichi Shimbun (July 28, 2015); "sudden showers" - Presence 53 (2015); "tamarind" - Frogpond 38:1 (2015); "still birth" - Blithe Spirit 25.4 (2015); "tattered quilt" - Wild Plum 1:2 (2015).